- How to convert PDF to editable text for free? - How to convert multi-column PDF to single column text? - How to convert convert PDF to text with good formatting? - Convert PDF to text with paid PDF converter or free PDF converter? Which to choose? Converting PDF to text is one of the most common features for standard PDF converting tool. However, there could be great difference in output quality. In our daily documents processing, PDF that with multi-column text is somehow inevitable. Unfortunately, many PDF Text converters handle single column text well but fail miserably when presented with a typical two column layout by interlacing the two columns. The following PDF converter review will introduce three effective ways to convert PDF to editable text using a 2-column PDF file sample and show the performance of PDFMate Free PDF Converter and its alternatives. 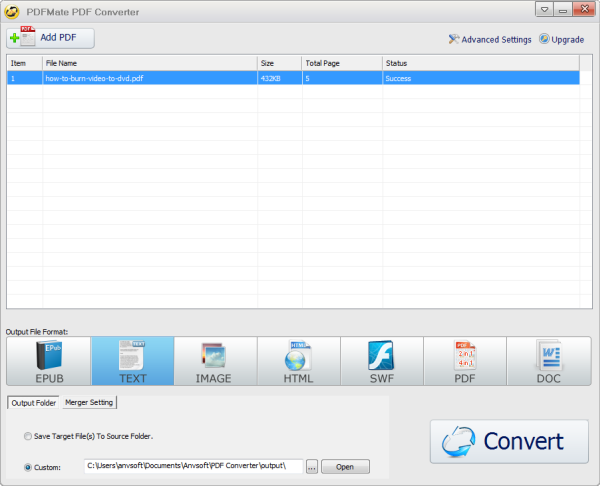 Looking for PDF to Text Converter for Mac, PDFMate PDF Converter is a good choice. 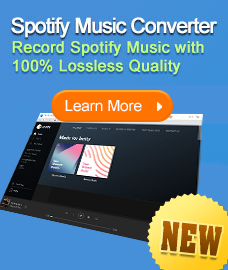 Wanna convert iTunes M4V movie to MP4, MOV, WMV...? Try M4VGear DRM Media Conveter! 1. 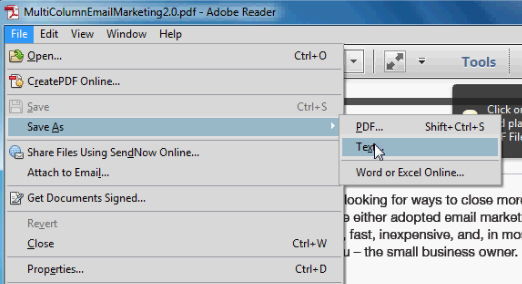 Convert PDF to Text For Free with Adobe Reader. As a widely used PDF reader, Adobe Reader is also capable of converting PDF to text. Here we use Adobe Reader X 10.1.3 to do the test. 1. Run Adobe Reader X then open the 2-column PDF document. 2. Click to File > Save as > Text. 3. Name the file in a pop-up window, then click Save. Output Performance: The conversion is rather smooth and fast. But as we can see in the output, the format is lost and all the paragraphs are joining together. It will take time to find the specific page if without comparing the original PDF. In the shareware market, it's never difficult to find a paid PDF converter that features lots of powerful functions. Now let's take a look at one of the most popular paid software called Wondershare PDF Converter ( named AnyBizSoft PDF Converter previously, cost $59.95 ) and see if it does what it costs in converting PDF to Text. 1. Launch PDF converter, click add files to load the 2-column PDF document. 2. Select Text on the right. 3. Designate an output folder in Customize and click Convert. Output Performance: Better than that of Adobe Reader, the output text is separated by page. And the text is easier to read. But the format is still a problem, especially for the text in illustration. Besides, there is no clue to tell apart the columns of text and paragraphs. 1. 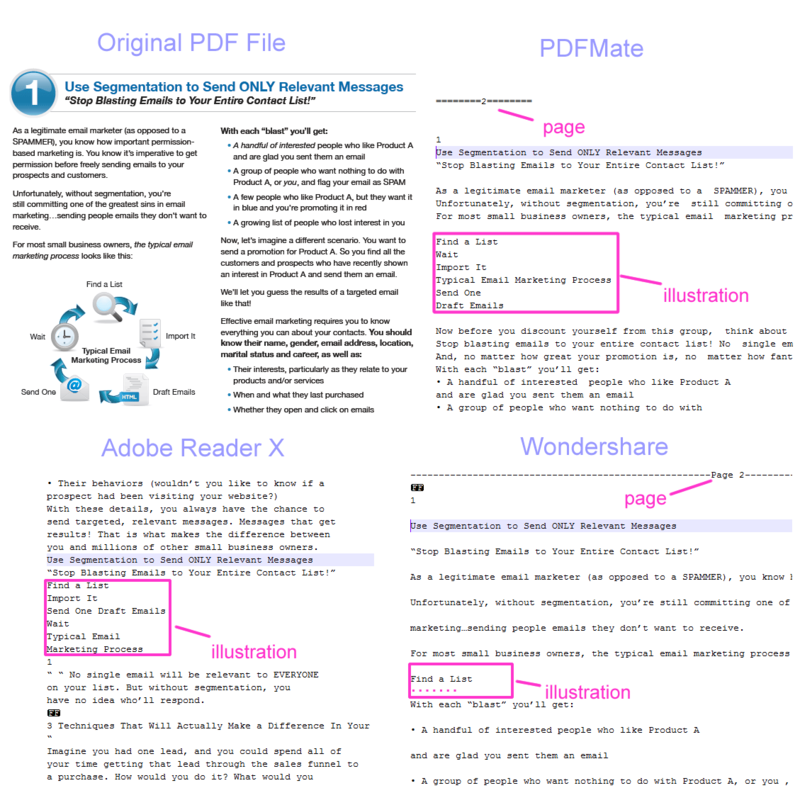 Open PDFMate Free PDF Converter, click add PDF to add file. 2. Choose Text as output format. 3. Define your output folder in Custom then click Convert. Output Performance: The output text is in good format. All the content can be separated by page. The columns, the paragraphs, the text in illustration and even in footer could be well retained with nice formatting. The three products are all able to convert multi-column PDF to single column text smoothly without mixing columns of text together but there are still differences in the output content. In order to show you the clear difference among the output of the three programs above. Here we present a screenshot of the output file open with Notepad++ and the original file for comparison. For a more comprehensive result, there is a table for showing the contrast of the three products. 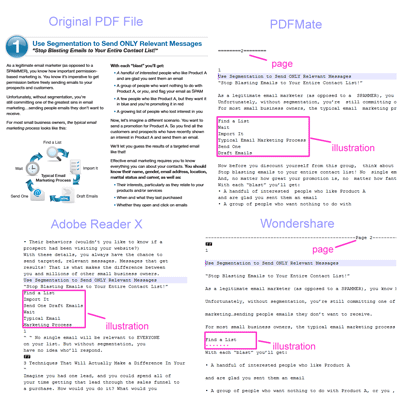 Want to convert PDF to editable text for free and get output in good format? You can download PDFMate Free PDF Converter then check out the excellent PDF to text conversion by yourself.